Black bear sightings in Connecticut are on the rise. Bears are attracted to the garbage, pet food, compost piles, fruit trees, and birdfeeders around houses. 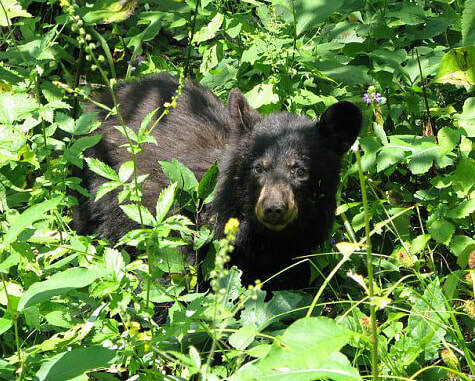 Connecticut residents need to learn more about bears and how to reduce the likelihood of bears becoming a problem. Aggression by bears towards humans is exceptionally rare. Bears need not be feared, just respected. DO make bird feeders and bird food inaccessible by discontinuing the feeding of birds from late March through November or by hanging feeders at least 10 feet above the ground and six feet away from tree trunks. DO clean and store grills away after use. DON’T intentionally feed bears. Bears that become accustomed to finding food near your home may become “problem” bears. DON’T leave pet food outside overnight. DON’T add meat or sweets to a compost pile. DO make your presence known by making noise and waving your arms if you see a bear while hiking. DO keep dogs on a leash and under control. A roaming dog might be perceived as a threat to a bear or its cubs. DO walk away slowly if you surprise a bear nearby. DON’T cook food near your tent or store food inside your tent. Instead, keep food in a secure vehicle or use rope to suspend it between two trees. DON’T climb a tree, but wait in a vehicle or building for the bear to leave an area.